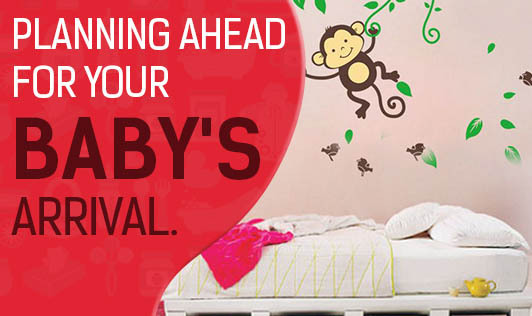 Planning Ahead For Your Baby's Arrival. Register ahead: For a smooth admission process, visit or call your chosen hospital or maternity center for pre-registration. This will ensure that all your details, your practitioner's info and insurance information are ready when you arrive. This will reduce the time consuming formalities and paper work that hospitals demand for on your unplanned arrival. Map Out: It is the right time to map out the direct route to your hospital or maternity center. Do it with your partner as he will be the one who'll probably be responsible to get you there. Also, plan an alternate route, in case of heavy traffic or any other unforeseen problems on the road. Be prepared with the mode of commuting to your destination as well. Pack your bag : Keep some comfortable clothes, inners, nursing bras, nursing pads, snacks and toiletries. Do not forget to include some portable entertainment goods like magazines, music and books to keep yourself occupied and enhance your mood. Keep your camera ready to capture the greatest moment of your life. You can also keep a call list ready in your cell phone to do the big announcement on your new one's arrival. Arrange for Caretakers: If you have older children at home, figure out who will be baby sitting them while you are away on delivery. Also, if you have pets at home, make sure someone supervises them. At home: Even a normal delivery will keep you off from home for a day or two. And, if it is a C-section, you are bound to be away from your home for 4-5 days. So, let your partner know everything about running the house in your absence if nobody else is available. Install an infant car seat: Installing a car seat may not be rocket science, but you need to definitely spend some time to perfect the technique. Install the car seat in advance and to ensure you have done it correctly, visit your nearest baby store. Ensure that you understand the seat handling instructions well and your hands are not fumbling with those straps. If so, then practice.